TEDxHanoi 2019 - Now What? You’re invited to get inspired at the latest TEDx event in Hanoi, taking place on January 19, 2019 at Vinschool Harmony. Conference pass will be on sales very soon in few days! TEDxHanoi 2019 is a day-long experience for people who care about ideas, connections and curiosity. 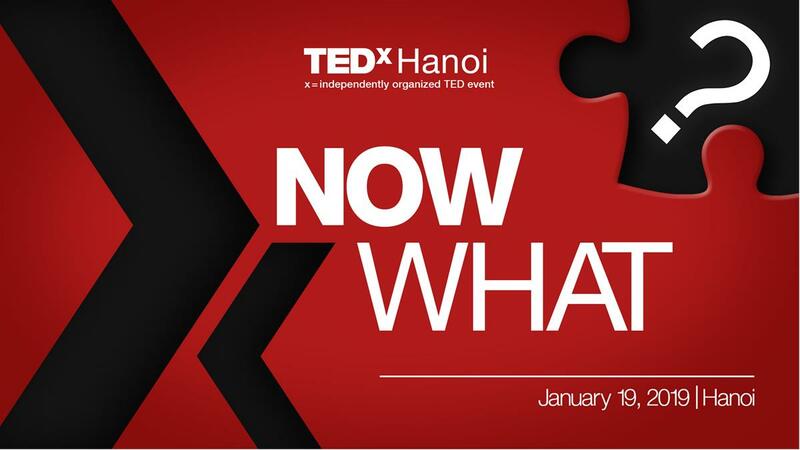 Join us and hear from some of the most intriguing speakers from Hanoi and beyond as they explore this event’s theme “Now What?”. The signs of Vietnam’s amazing progress are all around us. Increased growth from Vietnamese companies, and increased investment from international firms, lead to better jobs and rising incomes. With a new high-rise on seemingly every corner, more and more families can afford high-quality housing, and cars to keep their loved ones safe. Increasing numbers of students are studying overseas, while private schools and local universities are rapidly innovating to keep up with this demand. Rising incomes and improved education have unleashed a burst of creative energy, evidenced in the cool cafes, quirky restaurants, and innovative start-ups that populate Hanoi. Vinschool is a high-quality K-12 non-profit school system in Vietnam. Equipped with the most preeminent educational resources and facilities currently available, Vinschool aspires to become a world-class Vietnamese educational brand. Vinschool is diligently striving to build on the values of national education whilst refining the very best that international scientific education has to offer. With the mandate and vision of providing high quality education, Vinschool is perfect choice to host TEDxHanoi 2019 Now What? TEDxHanoi 2019 Now What? will be held in the 583 seat theater of Vinschool The Harmony. In September 2016, Trust of University Innovation in Vietnam appointed Ms. Thuy chief executive officer of Fulbright University Vietnam Corp., the entity which will operate Fulbright University Vietnam, the first private, nonprofit, American-style university in Vietnam. In January 2017, she was elected to be the founding President of Fulbright University Vietnam. Ms. Thuy received a BA from the University of Hanoi and an MBA from the Wharton School of Business at the University of Pennsylvania. After graduating from university in Hanoi, she co-founded a private foreign investment consultancy firm. She held a number of positions in Singapore, including director of project finance for oil and gas and chief of ANZ’s resources practice for the whole of Asia, then was appointed General Manager of ANZ Vietnam in 2005, making her the first Vietnamese national to lead an international bank’s operations in Vietnam. Douglas has worked as an American trained psychotherapist (Mental Health Counselor) in Hanoi since 2011 at Family Medical Practice. Douglas started his career as a teacher with students from 5 th grade to 8 th grade, before gaining a master’s degree in counseling psychology and working as a psychotherapist since 1996. His early experience was working in a high school-based teen health center in Seattle, Washington. He also worked at Shepherd’s Counseling Services which offers therapy for adults who had experienced childhood sexual abuse. In Vietnam, Douglas continues to see clients, teen- age and older, who are dealing with a variety of issues. Douglas believes that psycho-therapy is a process that brings about healing and involves self-discovery and acceptance. Douglas feels fortunate to do the work he does but insists that what is equally important is what he does outside of work. He believes that creativity and the creative process are lubricants of a self-actualizing person. Germ Doornbos and his partner Vũ Anh Tú founded Journey of the Senses; a hospitality company employing People with Disabilities (PwD). Noir. Dining in the Dark (2014) serves guests by a team of blind and visually impaired and Blanc. Restaurant (2017) invites guests to communicate in sign language with the deaf and hearing impaired. It is part social enterprise, providing job opportunities for (PwD) and part professional hospitality experience, it is unique dining experiences for the guests. Germ believes that placing PwD at the frontline and creating guest interaction is the way to increase awareness into the blind and deaf communities. His businesses are designed around the philosophy of turning the disadvantage of PwD around into their advantage. Germ is from The Netherlands and lives in Vietnam since 2004, in both Hanoi and Saigon. He has over 20 years hospitality industry experience and worked in various 5-star hotels and restaurants in The Netherlands, Italy and Vietnam. Since arriving in Vietnam over a decade ago, Justin Mott has established himself as one of the best-known and well respected photographers in Southeast Asia. He has shot over 100 assignments for the New York Times while a collection of his work photographed in Vietnam has been featured on the BBC. Additional major editorial clients include TIME, Forbes, The Wall Street Journal, The Smithsonian, and The Guardian among many others. His boutique visual production studio Mott Visuals specializes in premium commercial photography and video production. Mott is also familiar to TV viewers as host and resident judge of History Channel’s hit photography reality series Photo Face-Off now entering their 4th Season. Self-educated from the age of 11, Kevin went on to graduate with his first college degree by 18. From there he furthered his studies in Psychology and Nutrition, leading to his interest in health and fitness. He has most recently spent the past 5 years in Vietnam helping individuals and groups reach educational, professional, and physical training goals. In his work he emphasizes the value of minimal investment yet high return activities, a model he maintains in the company he co-founded: Citadel, a self-defense training company formed to help combat increased incidents of assault and theft in Hanoi. He is a strong believer that “there are no problems, only solutions” and that sometimes, if not often, solutions to the biggest problems come in the form of the smallest actions. Lan Ngo (Ngo Di Lan) is currently a Ph.D. candidate in International Relations at Brandeis University. His research interests include international security, territorial conflicts, and grand strategy. He is also the founder of the Vietnamese Youth Cooperation Organization, whose mission is to foster a global-minded Vietnamese youth through fun interactive activities such as Model UN conferences. Monique Sternin is the co-founder of the Positive Deviance (PD) Approach & Initiative, and Adjunct Associate professor, at Tufts University Friedman School of Nutrition Science and Policy in Boston, USA.. Over the past 28 years, Monique has been involved in developing and promoting the Positive Deviance Approach, an asset-based method to solve complex problems requiring behavior and social change which she pioneered with her late husband Jerry Sternin in Viet Nam in the 1990s. She teaches about the PD approach at a variety of universities in the US and consults for UN organizations and INGOs interested in applying the PD approach to complex problems requiring behavior and social change With her deceased husband, Jerry Sternin, and Richard Pascale, she co-authored the book entitled “The Power of Positive Deviance: how unlikely innovators solved intractable problems” published by Harvard Business publishers in June 2010. My-Linh Phan is an English and Language Art teacher at The Olympia Schools (TOS). My-Linh has traveled to 29 different countries and taught in America, Italy, The Dominican Republic and Korea before finally settling down in Vietnam. Once a debater, My-Linh was determined to introduce this art of persuasion to local students. She led D-Doxa – TOS debate club to multiple championships such as Hanoi Debate Tournament 2017, Innompics Games 2018 and received invitations to Japan, Singapore and Harvard College tournaments. On a national level, for 2 consecutive years, My-Linh accompanied Team Vietnam to compete in World Schools Debating Championship, where she also held the position of national adjudicator. Remarkably in 2018, after chairing 8 preliminary rounds, My-Linh broke and judged the quarter final along with Top 20 judges around the world. Receiving WSDC’s “Best New Nation” award with Team Vietnam inspired her to organize Hanoi Open-Vietnam Schools Debating Championship. Nam Nguyen is currently a junior at Washington State University (Washington, USA) pursuing double degrees in International Business and Marketing. Nam stands out as the first and only student in WSU’s 128-year history to study abroad on all seven continents. For Nam, studying abroad is not just about gaining new experiences, but an opportunity to not only allow a single set of ideologies, but to figure out a totally different style of ideologies. He believes that studying abroad has helped him learn more about himself as an individual and learn more about his own culture when seen in different lights. He is also a McNair Scholar, Carson Fellow, Harold Frank Engineering Entrepreneurship Institute Fellow in addition to being a NUFP Fellow with NASPA, the national professional association for student affairs professionals. Nam was recently recognized by NASPA with the Region V Undergraduate Rising Star Award. He loves learning and exploring new ways of thinking. Samie Al-Achrafi is recognized as one of the top ten global thought leaders on values and culture. His message inspires people to become the best version of themselves, imparting practical habits and tools to effect purposeful change. Samie is the author of 'Values: Creating, Aligning and Embedding Values in Organizations' and ‘Culture: a Guide to Organizational Blind Spots and Culture Change’. Samie's career spans 5 continents, working with governments and organizations around the world to create high performance cultures underpinned by values. As CEO of Marmalade Fish, Samie leads a team of Associates on an adventure to redefine leadership in business and reach 1 million people by 2020. He was named Most Visionary Business Transformation CEO in the Global CEO Excellence 2018 awards and voted Game Changer of the Year by ACQ Global Awards 2018. Tricia Nguyen (Thanh Trang) was born in Ho Chi Minh City, Vietnam. Studied at Rossall School, Lancashire, UK from the age of 9 and then went on to major in Textile Design and Fashion at Huddersfield University (England). Tricia has graduated with excellence from the HCMC Dance Academy and has performed for the Ho Chi Minh City Symphony Ballet and Opera. Currently she is the Artistic Director for The Open House Gallery. She has independently founded Wintercearig Project to raise awareness for mental health in Vietnam through contemporary art since 2017. Ha Khanh Phuong is a 9th grader from Hanoi who has always been interested in psychology and fantasy. That said, her biggest dream is to be a lawyer, and she believes that by combining her two interests — she would become a successful lawyer who changes people’s mind positively from different perspectives of their life. Since 6th grade, Phuong has been joining different debate and speaking contests, where she is given the opportunity to perform her hidden abilities and improve her self-confidence. In 2017, Phuong became one of the youngest contestants in EF Challenge (Speaking competition) final round, won a national debate prize at the beginning of 2018, and recently with her team, became winners in Global Champions. In this TedX event, Phuong shares about her worries on how artificial light pollution can stop future generations from observing stars and reaching their dreams, as well as why stars and dreams are important at first place. 1/ A full-day stage program with 12-14 live speakers with expertise in the fields of business, education, research, tech and the arts. There will also be 6 performances during 3 theater sessions program. 2/ Complementary lunch of healthy food to inspire ideas and conversation. 3/ TEDxHanoi gift bag including sweets, treats and vouchers from the TEDxHanoi organizers and our partners. 4/ Hanoi’s finest and brightest all together in one room – an unparalleled networking opportunity. 5/ Free traveling to the venue from Times city. If you’d like to attend our conference, you have to buy a conference pass and this year, the conference pass will grant you a membership for even more benefit. Due to limited seating and high demand, membership can be sold out quickly. TEDxHanoi 2019 Conference Pass Benefit​: 3 theater sessions, TEDxHanoi Gift bag, workshops pass, networking – lunch refreshment and so much more. TEDxHanoi 2018 is a local, independently-organized event in Hanoi that strives to re-create the unique experience found at TED. At its core, the fundamental goal of TED and TEDxHanoi is to foster and spread great ideas. We aim to provide a platform where thinkers and doers will be inspired and seize the opportunity to inspire others.